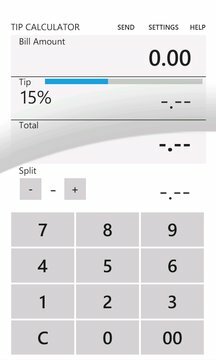 Simply the best TIP calculator in the marketplace! Designed to be clear and simple this app is functionality at its purest. Direct input of the amount, save preferences like your favorite tip and rounding amounts. It has ALL the functions, including splitting with detail and sending your split detail via email. It is actively maintained, so should you want something in here RATE this app and let me know. If you like it let me know by reviewing the app. - Save your favorite Tip percentage so that you don't have to enter it every time. - Correctly round the total and split values, making it easy for split payments and cash payments. - Will NEVER underpay due to floating point miscalculations like other tipping applications. - Calculate pre-tax tip, post-tax tip or simply add a percentage, touch your bill to see the value change. - Super clear quick and logical interface. No learning curve, round a number by touching it. - Gesture swipe left to backspace. - Simply enter your bill amount for an instantaneous answer, shortest possible entry to answer interface possible. - Free and always will be I have no interest in advertising or any other form of capital gain from this app. - Secure, no data is accessed or sent back and the calculator will work even in airplane mode. - Split detail bill and tip for individuals completing their own credit card slips. - QuickADD allows you to simply add numbers right then and there in the interface. - Email out your bill.